Pattaya police arrested a vendor for intimidating Chinese tourists after they refused to buy his bags. Tourist police in Pattaya and officers from the Pattaya police station arrested Somchai Kraiphan, 43, at a beach road of Na Klua beach at 9.30pm. Earlier, at 11.30am on Tuesday, a tour guide, whose Facebook identity is Wicha Tham, posted a 1.46-minute video clip showing Somchai shouting angrily at Chinese tourists. The clip showed Somchai threaten to shoot the tourists for failing to buy his crocodile skin bags after they asked for discounts. Wicha said in the post that he hoped Pol Maj-General Surachet Hakpal, deputy commissioner of the Tourist Police Bureau, would see the post and take action. Pol Lt-Colonel Piyapong Ensarn, inspector of the sub-division 4 of the Tourist Police Division 2, said Surchat saw the clip and ordered the arrest. 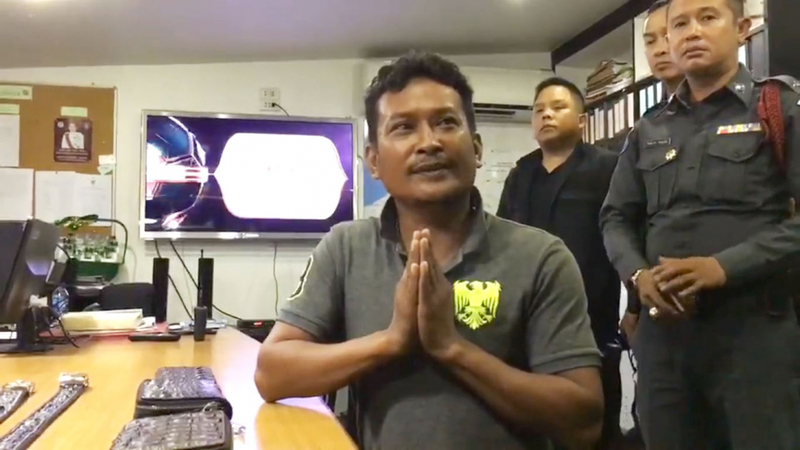 After his arrest, Somchai said he was sorry for what he had done. He said his case should serve to remind other vendors to have patience.